Defender Jersey and streamlined them. When you have the need for speed the Fighter. had the lean and solid Fighter Jersey. PROTO Paintball Jersey, Gray/Black, Men’s Medium-Large. PROTO Paintball Jersey, Gray/Black, Men’s Medium-Large. Tag is gone so unsure on exact size but is probably large. Condition is Pre-owned. Shipped with USPS Priority Mail. Have the following patterns. I have quantity of each pattern. Brown leaf. G reat looking shirt for any occasion! 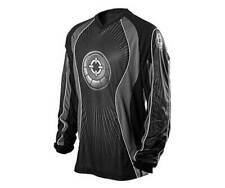 Empire paintball Jersey CONTACT ZERO Black and White XL. Shipped with USPS Priority Mail. I have a set of Proto Pants and Jersey in grey for sale. Pants are adjustable and very comfy. Jersey is nice and light. Lite weight with side venting to keep you cool. Clothing / Apparel. Airsoft Guns are TOYS and comply with all Federal Laws and Regulations. Any alteration (including color) will void the warranty of the item. Lightweight, comfortable and breathable with padding in all the right places makes this the ultimate jersey for all levels of play. Gun Upgrades. Airsoft Gun and Paintball Gun Information This prevents the Airsoft Gun from being mistaken for a real firearm. Rare vintage trebark Renegade paintball jersey. Great shape and fits like large (size can’t be read on tag). This is old school heavy material. Cuffs and collar are in good condition and not all stretched out. Low sound signature cotton rip-stop construction. Our founder who fell in love with the sport of paintball through a corporate team building event, found it very difficult to find gear at affordable prices in Tampa. Lightweight, comfortable and breathable with padding in all the right places makes this the ultimate jersey for all levels of play. Airsoft Gun and Paintball Gun Information This prevents the Airsoft Gun from being mistaken for a real firearm. Used but in like-new condition Proto paintball jersey. This jersey was used once. CUSTOM RAZA TOURNAMENT PAINTBALL JERSEY 2XL. EXCELLENT CONDITION. 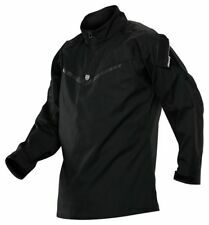 Planet Eclipse "OVERLOAD" padded protective vest. Size M. RARE! USED but in excellent shape. These are the secret weapon for competition paintball. No more nasty welts and WAY MORE "lucky" bounces. Padded in all the right places. Both are in fair/poor shape. Blue is Large black/grey is small. What you see is what you get. Sold as is. Mask / Goggles. Airsoft Gun and Paintball Gun Information Paint can stain. Cool Machine Wash 30 Degrees C. Comfort fit neck line. 100% Polyester. Other Information. No Softener. WONE Paintball Jersey/Tee Lot XL. All are new. One tee has manufacturing stain see photos. Sold as is. The Dye Tactical Mod Top is based on proven military designs. The sleeves feature 45 degree angle pockets for easy access during play and large circumference cuffs, allowing you to put the Mod Top on while wearing padding. I have done my best to describe the condition in words and pictures. Great color. The Professional Line from BT Paintball is not for the weak of heart or the weekend warrior. It is forged from rugged materials and combat-tested technology. This is not a camouflaged set of Speedball pants. INVERT PAINTBALL JERSEY XL Extra Large Black/Red. Condition is Pre-owned. Shipped with USPS First Class. Dye Paintball Bounce Shirt, great condition. HK Army HSTL Line Jersey - Camo S/M Paintball preowned condition, Hk Army Beanies Gray N ew w it h ta g.
Valken Tactical V-TAC Zulu Combat Shirt Jersey A-TACS Size Medium. Condition is Pre-owned. I wore the shirt about 5 times in the field. It is in extremely good condition with only a little Velcro spot on the front. 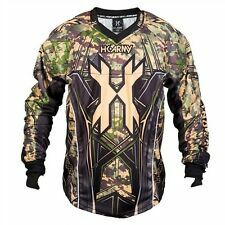 HK Army Paintball Jersey Camo - XXL. Condition is New with tags. Shipped with USPS Priority Mail. I have here is a SMART PARTS PAINTBALL FIGHTER URBAN CAMO JERSEY-SIZE-XXL (2XL). The jersey is in excellent condition as you can see in the pictures. I DO NOT see any rips, no tears, and no holes on this jersey. The jersey is PRE-OWNED/USED. If you need want me to pull the jersey inside out, please ask me. If you have any questions regarding this item, please feel free to ask me. Also, please check out my other items for sale as well. HAPPY BIDDING!! ALL SALES ARE FINAL!!! SOLD AS IS!!! NO RETURNS!!! ITEM INCLUDES DELIVERY CONFIRMATION TRACKING NUMBER!!!! Smart Parts Knee Pads M/L. Condition is New with tags. Shipped with USPS First Class Package. We've sourced the finest, light-weight, breathable materials to bring you the leading paintball jersey on the market. Each jersey is designed with high-density sublimated graphics, contoured foam impact areas, integrated protective gloves, and ventilated side panels to keep you cool. Chest patch with loadout webbing. Our founder who fell in love with the sport of paintball through a corporate team building event, found it very difficult to find gear at affordable prices in Tampa. This shirt is an adult size Small and is in good worn condition. Proto Paintball Chest Protector Medium. Condition is New with tags. Shipped with USPS Priority Mail. Chest patch with loadout webbing. Padded chest, shoulder and forearm protection. We will respond to your inquiry in 24-48 hours. Low-profile zip arm pockets. 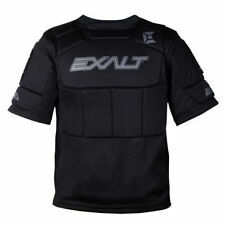 DXS DRAXXUS PADDED PAINTBALL JERSEY BLACK SIZE XL. We also carry our own rapidly growing line of custom products including tanks, t-shirts, barrel covers, tech mats and goggle bags. Helpful Links. Goggles must have the protection film untampered with. Airsoft Gun and Paintball Gun Information Clothing / Apparel. Soft, ribbed cuffs easy to slip over Empire elbow pads and gloves. Airsoft Guns are TOYS and comply with all Federal Laws and Regulations. EMPIRE CONTACT ZERO THT BLACK 2XL. Shipped with USPS Priority Mail. 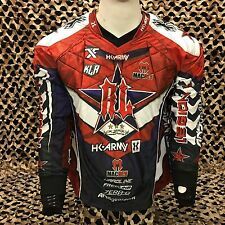 Kohn Sports Old School Jerseys Smart Parts Fabric Woodsball Paintball XL. Size xlarge but fits like a xxl. Treebark camo. Renegade material with mesh sides. Vintage. Camouflage. Condition is New. Shoulder to jersey bottom is 33.5” and armpit to armpit is 27”. Shipped with USPS Priority Mail. PLANET ECLIPSE HDE CAMO PADDED PAINTBALL JERSEY 2XL. Excellent condition. Lost alot of weight and its huge on me.